Use the Schedule Disruption Notice Letter to inform staff or clients of a planned schedule disruption, such as a fire drill or scheduled outage, such as a shutting down electrical power, shutting off the water supply, or shutting down internet service to install new components or perform maintenance tasks. This Schedule Disruption Notice Letter is included in editable Word format that can be customized in Word or by using the included Wizard software. How do you write a Schedule Disruption Notice Letter document? Use this document to inform staff or clients of a planned schedule disruption, such as a fire drill or scheduled outage, such as a shutting down electrical power, shutting off the water supply, or shutting down internet service to install new components or perform maintenance tasks. You may want to change the title of this page to name the specific event. Date of Notification: Current Date. Re: Company Name Notice of Schedule Disruption. This notice is to inform you of a insert what the disruption will be-emergency drill, power outage, etc. scheduled to take place on date of disruption from approximately start time to end time. Please plan your activities accordingly. Thank you for your cooperation. 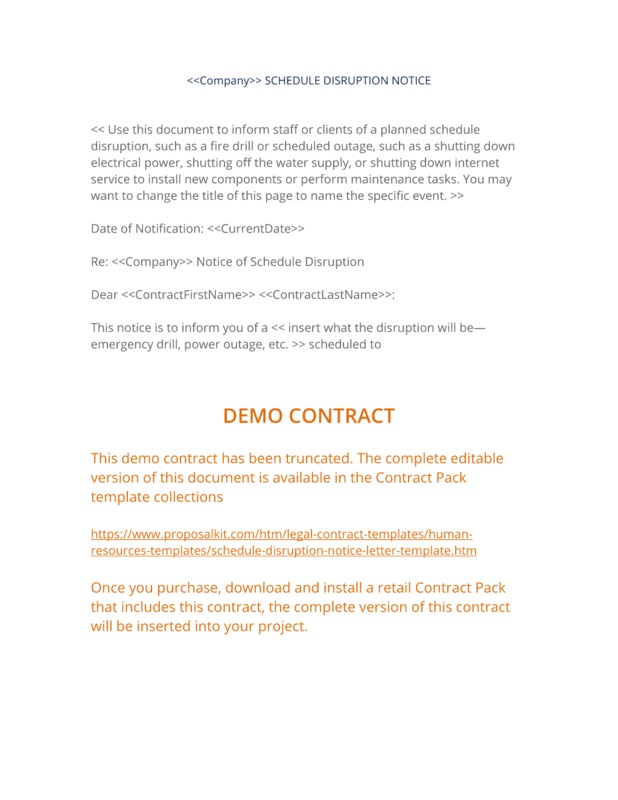 The complete Schedule Disruption Notice Letter - with the actual formatting and layout - is available in this Contract Pack.